We are always at a lack for phone chargers in this house! I ordered two from Ebay just before our trip to South Carolina, and then ordered a couple more earlier this week. Frank needs one for his car, so one is already claimed, and I need one for myself (since the last one I had seems to have flown the coop). Most of the chargers in the house are either black or white and fit the Samsung/Motorola phones. It’s hard to tell who borrowed what charger. As I unwrapped my precious new friend, I came up with an idea. Washi tape. I can’t admit to patience and precision on this little project. I’m sure someone can improve on the final product with a little more time spent lining patterns and seams up. I just wanted a quick way to mark my territory on this charger. Somehow yesterday as I scurried around the office trying to accomplish all the tasks before the end of the day(cramming days worth of work into one day), I failed to realize that, when my day was done, I was off work for nearly a week. Wednesday, Thursday, Friday, Saturday, Sunday… I don’t know how it didn’t cross my mind until I bid my boss farewell. “See you… wait. See you next Tuesday. Huh.” I work at home on Mondays, so technically – Tuesday it is. This past Sunday was spent cooking dinner and hosting Thanksgiving. Scrambling was the name of the game on Monday. Tuesday was drop the kids at school, fly to work, come home, get dinner ready to avoid a take-out meal, and then savor the 15-minutes of Me Time listening to my new-found love, Librivox on the iPod while knitting and waiting for everyone to burst through the door. I really did relish the time. I had to check myself from moaning a stage-worthy complaint when I had to put my knitting away and detach myself from the recliner. Homework, updates, completing the concoction that was dinner (turkey and bean tacos), jetting off to wrestling practice where we take both the car and the van so the car can be handed over to the high schoolers (Dante and Carlito) who are just finishing up with their wrestling practice. I went to a board meeting (wrestling stuff), Frank coached. An hour and half later, we’re on our way home to a house with ready dinner (score), showered high schoolers (another score – the younger two get to hit the shower without a fight). The whole time I’m thinking of my audio book and completing my scarf that I’m knitting to donate to the homeless shelter via my work, mind you. In my bed at 10pm, earbuds in. Scarf completed and on to scarf #2. Who’d of thunk it? Today the elder boys, once again, took the car to school and I am left car-less. This is preferred, as of right now at least, to having to drop them off at 6:30am and pick them up again at 6pm with their two-a-day practices twice a week. If I’m desperate, I can walk to Wal-mart. It’s not much more than a mile or two away. I have enough to do at home that it’s not a bother. 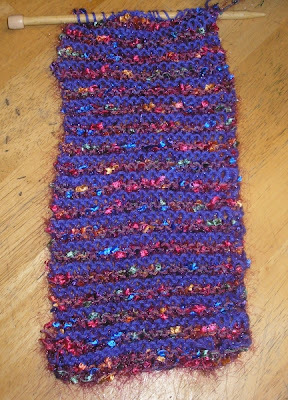 Loads of laundry are being washed, yogurt is being made, dog has been walked, the 2nd scarf has been completed. Now I need to move on to the tedious tasks like paying bills, cleaning the bathroom and cleaning up around the house. Oh, and figuring out something for the wonderful thing called “dinner” – that’s right. Tomorrow — feasting at the cousin’s house. Frank’s side of the family. I’ve only been asked to bring an appetizer. I can manage that. Then, if everyone does as I say – we’re off to pick up our Christmas tree. I’d like to decorate early and get the most out of the season. It goes by so quickly every year that as soon as I get them up, I’m needing to take them down. Happy Thanksgiving. Wishing everyone safe travels, delicious food, and a bounty of gratitude. So glad I got started on that scarf. Sigh. In true form of my compulsive craftiness (ie. A.D.D. knitting), I abandoned the scarf to work on a hat. Not needing much of an excuse to do so, since my natural inclination is to abandon projects, particularly scarves it seems. But the other day Franny remarked on how our hat supply had dwindled. 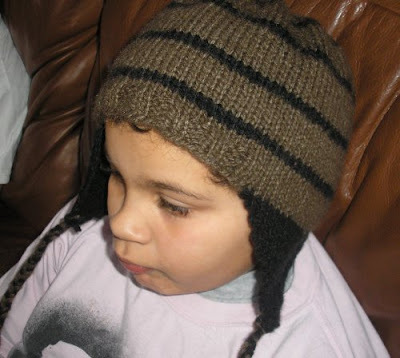 That was Monday, and by noon I was at the store buying black and brown yarn and by Tuesday night was weaving in the ends on the completed hat. I had DT try it on for me and he said, “Nice hat, too big though.” And that’s pretty much what they all said, the little boogers. I was nearly maniacal, silly drunk with knitting that the “too big” part hurt me wee ego a bit. But, hey. I successfully worked some DPNs this time, so it is a learning process. Lootie was my kind model. Again. So grace-filled in the morning hours while munching waffles before school. I’m guessing my next hat will be started within a day or so. I’m a knitter, but I’m not a knitter, if you know what I mean. I like to knit. I enjoy making fast and easy projects. But I can’t make a sock, or a sweater. And, for the most part, I have the tendency to abandon projects. I guess in my head I’m not abandoning them, but more “moving on to something else” for a bit. 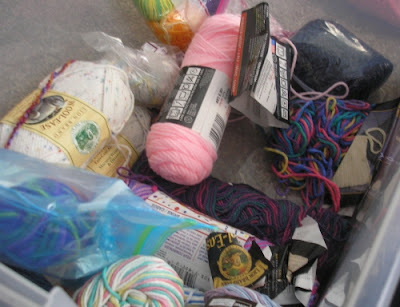 Right now I count… 1 blanket, 1 prayer shawl (ripped that out, though, made a major boo-boo with that… first time on the circs), 2 or 3 scarves, one dishcloth. Just off the top of my head. I’m an ADD knitter. It is what it is. Boredom with my current scarf project motivated me to dig out my box of yarn. I figured I could use up some of it on a project — maybe a hat. Mind you, there’s nothing to salivate over, no yummy hand-dyed yarns or expensive ooh-la-la skeins. 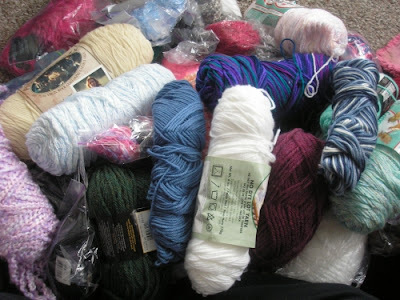 A bunch of discarded yarns, really, bought for some project I meant to make but still haven’t gotten around to. Some of it is Sugar and Cream leftovers from my dishcloth making obsession, yarns for preemie caps, Fun Fur, stuff like that. Did find some nice wool in there. I have additional skeins lying around in mid-project or in bags, waiting to become yet another abandoned project. Yarn is like books for me. I shouldn’t buy anymore until I use (read) what I’ve got. I could make hats for the kids. We can never have too many. Or an abundance of hats, scarves, mittens, preemie caps, maybe a prayer shawl for charity. But, as compulsion would have it, as the yarns slipped through my fingers, I felt inspired to run to Hobby Lobby and pick up yarn for a scarf pattern I found. 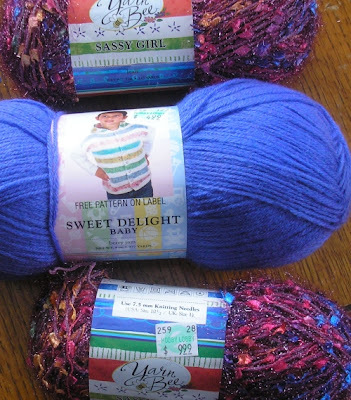 The fancy yarn, marked $9.99, I got for $1.99. Lootie helped pick it out (he loves the craft store). I needed a second yarn, but ended up going back a couple days later to painfully pick that out (hard time making decisions). I’m about 1/3 through the scarf. I messed up in the beginning bringing the yarn up the side as I knit and didn’t realize that I was carelessly adding in some stitches for a few rows. Was yapping with the husband, too lazy to go back and take it out. I’d really like to finish this scarf. I need a new one badly. 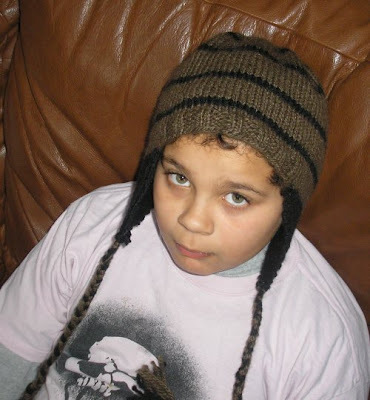 And I still have that itch to knit a hat. Another project finished!! My Two-Hour Scarf. My mother was admiring one of my scarfs the other day and said that she wanted to star wearing scarves to cover up the wrinkles on her neck. I told her she could just gain some weight to “fill out” the wrinkles — how fun!! — but she didn’t like that idea. She figured scarves would be a good way to update her wardrobe without spending too much.